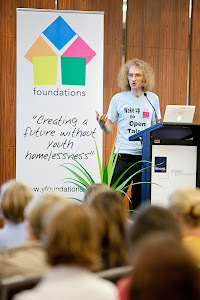 Wollongong – but not forgotten – after a wonderful day with Narelle Clay, Kristen Day and the team from Southern Youth and Family Services (SYFS) in Wollongong, Illawarra, 80km from Sydney. Wollongong might be famous for its coal mining history, but it is SYFS’s holistic offer to young people which provides and supports a rich seam of local talent. I saw a mix of services on my visit, including a youth health and outreach service, a crisis refuge, a medium-term housing and support service, and some Foyer projects. Together, these and other connected specialist services outline a transitional roadmap for young people. It made me think a bit of the original ‘Step by Step’ approach in Aldershot, or Forum Housing’s model in Birkenhead. The ethos across different services is consistently strong – person focussed, with an attention to quality detail, good resources and resourcefulness, and above all an investment in the idea of community belonging. Certainly, I can’t remember ever seeing so many xmas decorations! The idea of the Foyer ‘deal’ was evident in a prevailing culture of rights, responsibilities and commitment between young people and staff. Both were articulate and passionate about what they were doing. These were environments I would feel happy living and learning in – which has always been my inner litmus test. At lunch, we tucked into Pavlova for dessert, which struck me as an appropriate metaphor for SYSF: a firm defined outer core, nurturing soft skills within, with a topping of cream. Looking at the stats in the annual report, they seem to be doing a decent job, too, on what they describe as ‘turning off the tap’ to homelessness and ‘enhancing opportunities’ to improve and expand. I loved some of the creative acronyms for programmes – RAGE, for example, is ‘resourcing adolescents to gain essentials’, while ‘HAPY’ is for Healthy Active Positive Youth. As well as being a service provider, one of the aims of SYFS is ‘to act as an advocate for and facilitator of structural change that achieve improved living situations for young people and their families’. That aim was evident in our final conversation before the train back: on the need to campaign for greater flexibility in policy and funding to ‘open talent in all young people’. I left them with a couple of Open Talent usb wrist bands, and took with me the feeling that we had started a powerful conversation to connect across the world.